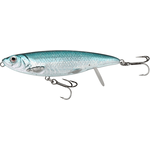 Cantitatea minima pentru "3D Twitch Minnow 6.6cm/5gr" este 1. Based on the scan of a real baby herring. The perfect mini jerk and twitch bait – great flashing action with horizontal balance, suspending on the stop. Long cast system.